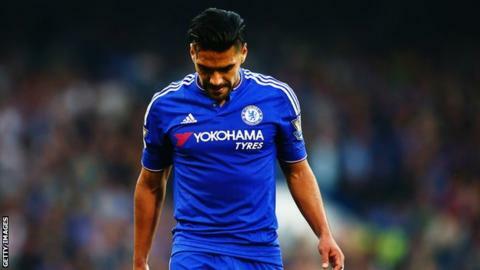 Chelsea striker Radamel Falcao is out until at least mid-January after a setback in his recovery from injury. Falcao, 29, is on a season-long loan from Monaco but has not played for the Blues since the 3-1 defeat by Liverpool on 31 October. Chelsea interim boss Guus Hiddink says Falcao has suffered a recurrence of his thigh problem during training, and that it will be "10 days" before he is fit. "I think it's back to square one," said the Dutchman. "We had him in a game and he had this injury again that he had before. It's the inside of his thigh. "We hope within 10 days he might be fit again, though not to play." Falcao, who spent last season on loan at Manchester United, has made nine Premier League appearances for Chelsea since joining in the summer, scoring once. The Colombia international has never rediscovered his form since suffering a bad knee injury while playing for Monaco in January 2014. Meanwhile, Hiddink has expressed his disappointment at Aston Villa manager Remi Garde's decision to publicly confirm his interest in Loic Remy. Garde wants the Chelsea striker on loan in January, saying he would be "an interesting player" for his side, who are bottom of the Premier League. "You have to respect where the players are," said Hiddink. "If you are interested, talk first to the people with whom they are contracted. You cannot go into details. "The player has signed a contract here and must be fit for us. He's having a difficult time regarding his injuries. He has to prove first of all that he's a good Chelsea player."